Professional rug repairs are necessary to get your rugs looking great again. Professional rug repair will save you money, time, and the headache of looking for a new rug. When choosing a rug repair company, you want to pick one that is trusted and has years of experience. KIWI Services in Copperfield has 30 years of rug repair experiences and we have hundreds of thousands happy customers. 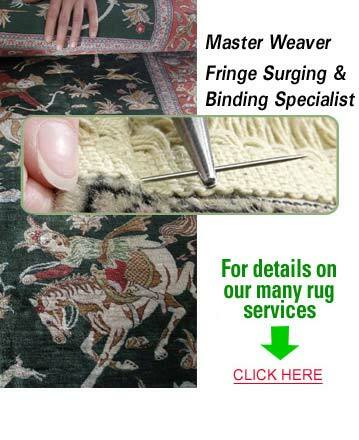 KIWI’s rug repair services are the best in Copperfield. Our rug repair team can handle all kinds of repairs. Our team consists of a senior rug expert, a master rug weaver, and a fringe surging and binding specialist as well as professionally trained rug repair technicians. Our rug repair team can work on numerous rugs.